Web solutions and custom programming services at pcOffice Pro. Visually your website is the first impression your potential customers will have of your company. It portrays the image of your company. The web design has to be appealing, informative and yet optimized behind the scenes for speed, function and search engine ranking. or the business, the web design must be affordable and easily maintained to reflect growth and change. It must be an extension of the marketing and sales force. It must be needed; must be used; must be valued by your customers. What impression do you want to leave with your customers? Utilizing web design templates for cost reduction and graphic consistency. Adding database functionality into your website for more powerful solutions utilizing Active Server Pages (ASP) or Hypertext Preprocessor (PHP). 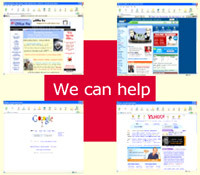 Optimizing website pages for search engines. Content Management Services through our Professional Services. So whether it is an eye-candy, data-driven or e-commerce web site, pcOfficePro can deliver! pcOfficePro can also provide custom solutions outside of the scope of your company's current software platform. As savings today are measured in minutes, a successful company manages their minutes and makes them efficient. Capitalizing on your company's current software infrastructure, pcOfficePro's custom programming can help yield measurable results in efficiency. Why pay for custom built applications when most applications can be developed within your current software platforms - Software you and your employees are familiar with and use every day. Measured results mean savings to your company. Familiar products mean less training and less resistance to change. Using in house software means affordable solutions. Microsoft Office...Excel, Word, Access....names we all know and use. Microsoft Office (Excel, Word and Access) are all registered trademarks of Microsoft Corporation. pcOfficePro 's business is built on enhancing your current software solutions to provide robust solutions with measurable efficiencies. Rates will vary depending on the project and programming language used. A project assessment will be conducted and then pricing will be forwarded based on the assessment.